KBR #202 - 2 Bedroom/2 Bath Ocean Front unit on Sugar Beach! The resort itself is a real gem. Nestled into a quiet, safe community, the vibe here is one of low-key local that lets you know you are in an authentic place, not some theme-resort approximation. Centrally located in North Kihei on the shores of Sugar Beach, Kihei Beach Resort is a favorite of return travelers. From here you can venture forth with low commute times (15-45 minutes) to enjoy most of the awesome adventures and attractions Maui has to offer. Two long & winding roads—one to the summit of Haleakala & the other through the rainforest heading to eastside Hana—are much longer treks to places remote, actually; but places not to be missed if one can help it. On days you want to stay close to base, stroll the (almost empty) 3 mile stretch of white-sand shoreline known as Sugar Beach. The resort’s 1.3-acre grounds tempt you to stay and relax by the pool, sunbathe on the beach, or grab a lounge chair under a palm tree and read a book. From the grounds & pool you have panoramic, nothing peek-a-boo-about-them coastline views that extend south to the Makena cinder cone, sweep out across the water past Molokini Crater, neighbor islands Kahoolawe & Lanai and north to Maalaea Bay with its backdrop of white windmills marching up the ridges of the West Maui Mountains. It’s fun that Kihei Canoe Club is next door to the resort. Watching the canoes during practices or races is a cool diversion most other resorts can’t offer. On Tuesdays & Thursdays they offer visitors an opportunity to paddle out with them ($40 donation)—so worth it! Across the street is a quaint collection of local treasures: a farmer’s market featuring local fruits & vegetables, Ululani's Shave Ice Store, Sugar Beach Bake Shop, & an ABC convenience store. You will find yourself there more often than you think—it’s one of those spots! And just down the road a bit toward Kihei, you will notice a most charming church, painted plantation green with white trim & exuding the Aloha spirit. Keolahou Hawaiian Congregational Church holds services in English & Hawaiian on Sunday mornings—open to all; on Thursday evenings they host 808 Uke Jam, a gathering of ukulele enthusiasts of all different levels who play, sing, learn & share aloha; it is free & open to the public. It is priceless. 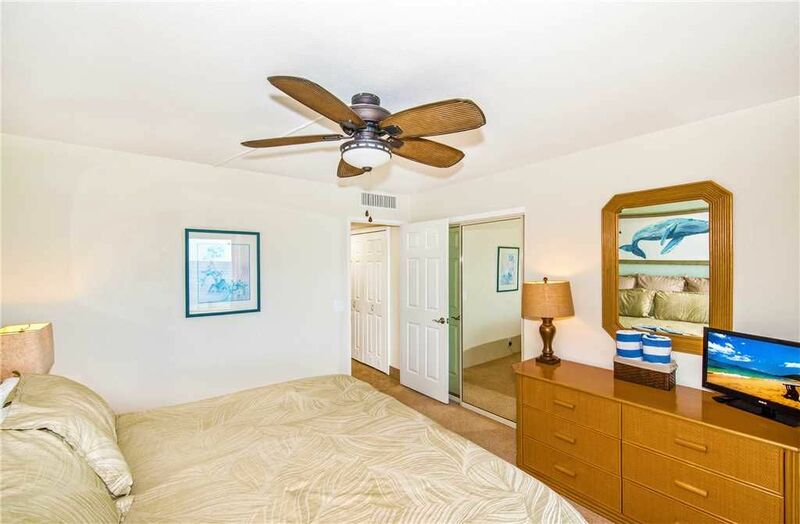 By the way, this condo is professionally managed by Destination Maui Vacations, an on-island management company with more than 40 years of history on the island. Our offices are located nearby, with an easy-to-reach & courteous staff. We love to help & will do our best to ensure you have a wonderful stay on Maui. Beachfront views, pool, across the street from small farmers market, Sugar Beach Bakery and Ululanis (best shave ice on da island). Two bedrooms, one king and other has two twins. Perfect! Friendly staff and good service. Mahalo nui loa! Mahalo for your review. We hope to see you again! The condo has everything we needed for our time in Maui. It's hard not to fall in love with a 50 foot walk to the beach. The views were spectacular. The location on the island is central and convenient for beach and island exploration. We had plenty of space, utensils for all the meals we prepared in the unit, and it was great having a washer and dryer in the condo.. An extra bonus was having folding chairs and a cooler for our trips to the beach. Daniel from the management team did a wonderful job of being available for any of our needs. Mahalo for staying with us! We're glad you enjoyed the condo as well as the beautiful views. It's our pleasure to be of service and we look forward to your next trip! Aloha. Wonderful Location, Unit 202 was not cleaned properly! The grassy area fronting the beach is so well maintained, the beach is well maintained, the woman that helped us check in was very nice. Such a beautiful location, family friendly, needs TLC...... The carpet & drapes are old/tired, worn out, and dirty The end tables in the master bedroom were dirty/finger prints/cup rings/spilled liquids Glass table in the living room under glass dried spilled liquid/finger prints Sofa & rocking chairs had stains The table/chairs on the lanai was filthy The railings were dirty The washer had so much sand in it; we cleaned it The shower doors could use some cleaning, hard water stains The room that housed the washer/dryer/air conditioner is filthy and probably toxic Tree trimmers were cutting trees when its gale warnings; also, there were cars parked below; could have placed a sign night before to notify guests The air condition is from the 60's/huge/loud/dirty/not cold enough The outside of the building facing the street could use some pressure washing, the stairwells, the elevator. Mahalo for your review! We look forward to your next visit. Aloha. Unit 202 appears to have been recently renovated, with an upgraded kitchen and bathrooms. Interior was nicer than another unit in which our relatives were staying. Nice ocean view. Second floor location feels a little too close to the pool and lawn, thus severely diminishing privacy. We love the northern end of Kihei because we tend to do things all over the island, and the location is very central. We very much enjoyed our stay in this unit, but we might try a higher floor next time. Thanks for staying with us! We're glad you enjoyed the upgrades in the unit. We hope to have you back again soon!